Egyptian writer and novelist Ezzat El-Kamhawi was named as the winner of the 2012 Naguib Mahfouz Medal for Literature for his novel Bayt Al-Dib (House of Al-Dib). The announcement took place in a ceremony held at the American University in Cairo student dormitory in Zamalek on Tuesday, 11 December. The judging panel was headed by Dr. Tahia Abdel Nasser, the granddaughter of the late Egyptian President Gamal Abdel Nasser. The panel also included Shereen Abouelnaga, professor of English comparative literature at Cairo University, translator Humphrey Davies, critic Mona Tolba and the Lebanese poet and critic Abdo Wazen. The award consists of a silver medal and a cash prize, and the winning work will also be translated and published throughout the English-speaking world. In their citation for the award, the panel described Bayt Al-Dib as a "tour de force of fiction that interweaves a fictional village with strands of Egyptian history from Ottoman rule to fin de siècle Egypt." "The personal and political are intertwined subtly, and thus the formative years of the place and its inhabitants are inseparable." El-Kamhawi, who came from Doha to receive his award, expressed his pleasure at receiving an award that carries the name of his literary master, Naguib Mahfouz. The American University in Cairo has granted the award annually since 1996 on 11 December, the birthday of the Egyptian literary icon, who died in 2006. 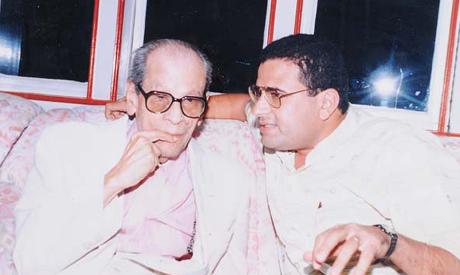 "It's no day to feel happy as we witness this political turmoil in our country, but I tonight i stand here feeling honoured and proud to receive an award with the name of Naguib Mahfouz, who taught us is the loyalty to writing as an organic function that a writer cannot live without," said El-Kamhawi. 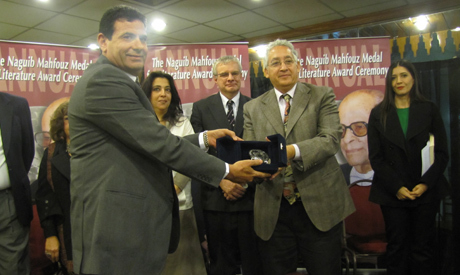 The Naguib Mahfouz Medal for Literature has been awarded to 19 people since its inauguration, including 8 women and 10 men, 11 Egyptians (2 posthumously), 2 Palestinians, 1 Algerian, 1 Lebanese, 1 Moroccan, 1 Syrian, and 1 Iraqi. The prize is awarded on the basis of the literary excellence of the work, as agreed by a panel of judges. The award committee meets in early summer to establish a shortlist of nominees and in the fall the judges make a final decision, prior to the award ceremony on December 11 of every year. Ezzat El-Kamhawi was born in the northern governorate of Sharqiya in 1961. He graduated from Cairo University's Faculty of Mass Communication in 1983 and helped to establish Egypt's leading literary newspaper Akhbar Al-Adab in 1993. In 2011 he moved to Qatar to become the editor-in-chief of the Doha Cultural Magazine. He is the author of ten books, including four novels and two collections of short stories. Bayt Al-Dib was published in Beirut by Dar Al-Adab in 2010 and is expected to be translated into English in 2013 by the American University in Cairo Press. Political turmoil in Egypt and an ongoing sit-in in Tahrir Square forced the AUC to change the location of the ceremony from the Oriental Hall at the AUC Tahrir Campus to the dormitory building in Zamalek. Last year's event was cancelled because of clashes between protesters and Central Security Forces in the vicinity of the Tahrir campus, and the winner declared by press release. The award was officially granted to "the Revolutionary Literary Creativity of the Egyptian People."